Medicine Trail Entrance with our UpS Grant Recipient Sign! 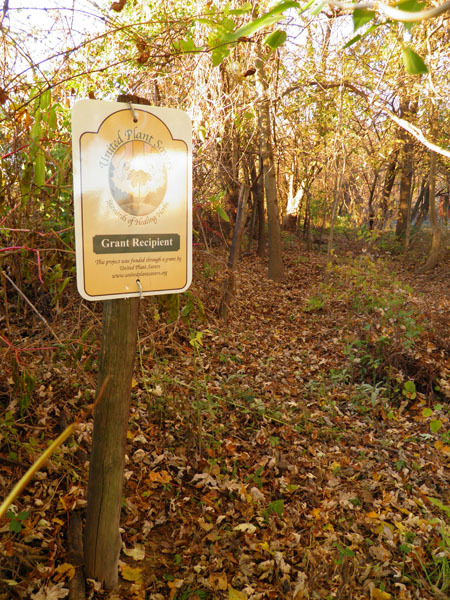 Starting in April 2015, we began clearing invasives from the western portion of our property with the goal to create a medicinal woodland trail. The area is overrun with bush honeysuckle, trash and debris, neglected from the previous owners. Clearing the debris from this farmette has been an ongoing process over the last 10 years and this is the first year that the possibility of cleaning up this side of the farm became available. The area is rich with promise, hosting a variety of native slippery elm, elderberry, oak and more. We worked on a third of the trail this year, clearing the invasives, piling them on the western border to create natural habitats for critters and preparing beds for native medicinals to be planted. We also worked to clear out trash that had been left by the previous owners as well as trash that had blown in from the subdivision next door. At the end of April our first round of medicinal plants arrived: 40 luscious plants, 10 each of: Black Cohosh (Acteae racemosa), Blue Cohosh (Caulophyllum thalictroides), American Ginseng (Panax quinquefolius) and Goldenseal (Hydrastis canadensis) from Companion Plants in Ohio. These beautiful bare roots were quickly settled into their beds and labeled. I also received some Wild Ginger (Asarum caudatum) from a friend which was also planted along the trail. Mid-May saw the arrival of more plants: 5 False Unicorn Root (Chamaelirium luteum) plants arrived, along with 2 Wild Hydrangea (Hydrangea arborescens). A few days later, 5 True Unicorn (Aletris farinosa) plants arrived and were placed in a sunnier location of our garden. Eventually, they will be incorporated to the beginning of the Medicine plant trail when the beds are prepared accordingly for them. Our summer provided lots of rain so after the first few weeks, we did not find it necessary to water the plants anymore. The rest of the summer was spent maintaining the area, mostly keeping the honeysuckle from returning. Most of the plants have gone dormant at this point, nestling down for the winter. We will spend the autumn raking the leaves into the plant beds to provide extra mulch for nourishment and protection during the winter. Over the winter we will be making signs to place in the beds. Next spring we plan to double the plants in the beds and add some native Trillium (Trillium recurvatum), Solomon’s Seal (Polygonatum commutatum), Solomon’s Plume (Smilacina racemosa), Mayapple (Podophyllum peltatum) and Bloodroot (Sanguinaria canadensis). We will also begin clearing out the next portion of the trail. It is our hopes to have the trail completely cleared in the next 2 years, opening it to the public for a educational walking trail. In the meantime, we plan to host plant walks to the community starting early next summer for the first portion of the trail.